29th June 2010 – At some point, they had pored concrete in the bow of the Frantsis. during the years this concrete had become loose, or some of it . 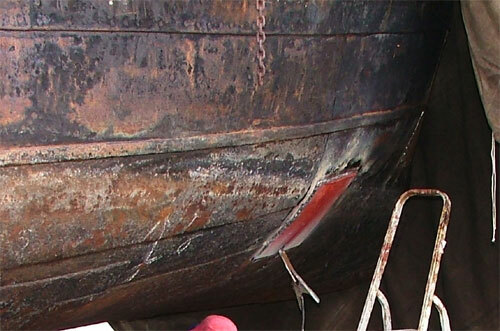 Because of the rust, some of it was pushed away from the hull. It wasn’t looking right and it could cause problems in the future if water would get to it. therefore I decided to remove most of it. After one evening of work, some of it was gone. The remaining part will be removed with the right equipment..
28th June 2010 – To my knowledge, the fore peak was the dirtiest place on the Frantsis. 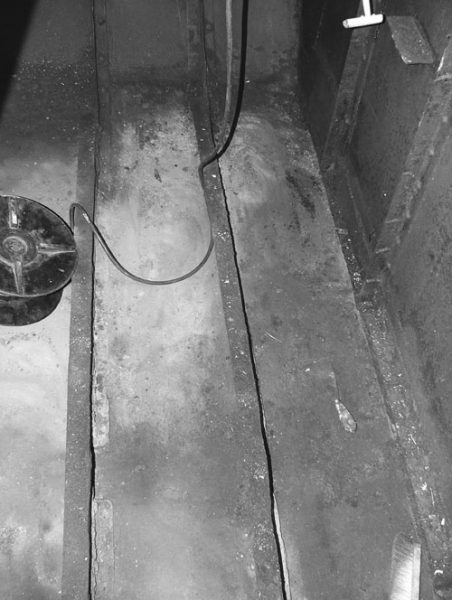 The engine room may be a bit greasy, but the amount of dust, rust and nails and screws in the bilges is tremendous. By the end of the evening, the front was lifted around 10cm out of the water. My parents will come tomorrow to take as many bags with rust with them as their car can hold. 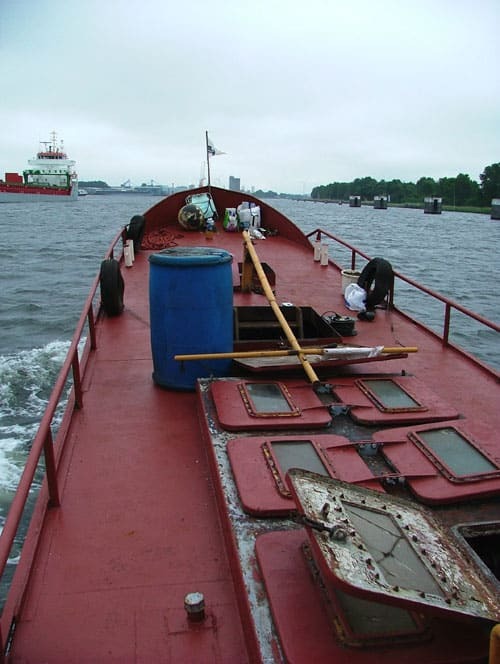 27th June 2010 – While most wood was already removed, some was still aboard. I took it out and gave it to a few neighbours. Temperatures were high and the wood heavy, so it took me nearly all morning. I had plans to do more, but that will be for another time. 26th June 2010 – There are still many tools and boxes with useful stuff in the hold. I took them out and put them in the engine room of the Watergeus. If I continued to collect stuff the way I’m doing now, very soon I might buy a bigger barge. 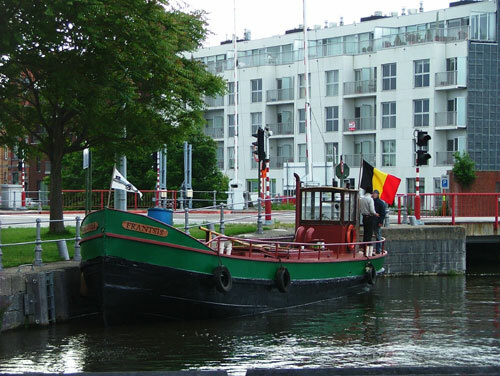 19th June 2010 – We left Moerbrugge in the early morning and arrived a few hours later in Bruges. We moored the Frantsis along the Watergeus. I went to bed for a few more hours. 18th June 2010: After a few small issues, we left the yard at 6 o’clock in the evening. 16th June 2010 – Yesterday, we bought the batteries and the white diesel for the trip. The batteries were mounted, the engine started and the fuel added to the tank. 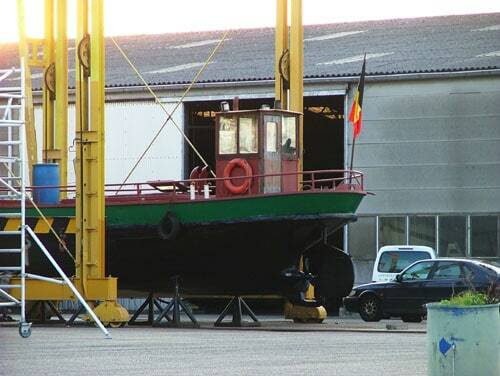 Life rings were mounted on the wheelhouse and the boeisel got a second coat of green. 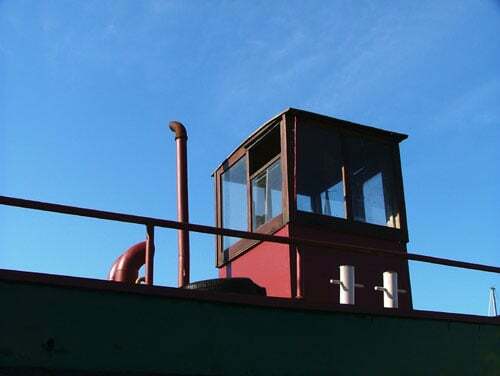 Navigation lights were mounted on the roof of the wheelhouse. 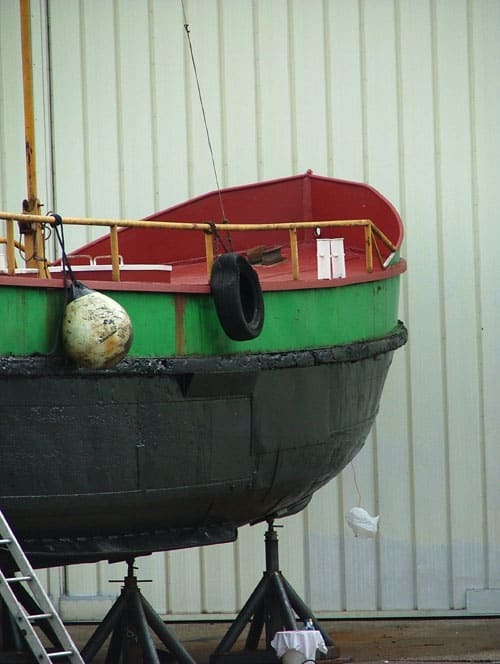 15th June 2010 – The fourth and last coat of paint was added to the hull. The green boeisel was repainted and the name boards mounted on the front. She is ready to be launched! 13th June 2010 – Today it was my turn to paint the ship. First the deck, then the hull. She is really looking different now. Not longer that wreck of Zwartsluis, but again a nice looking Beurtschip. In the evening I visited some friends in Sluiskil, a few miles down the road. I lived there for a year with the Watergeus, but I’ll never forget that little town. 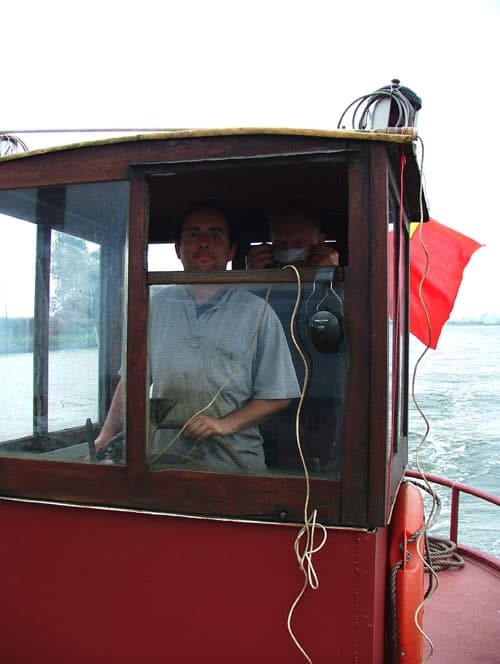 11th June 2010 – In the morning my neighbour drove me to Terneuzen, I can’t drive myself with only one eye and no depth view. While I could not weld, I cleaned the engine room, a dark place! I scraped the remaining parts of the hull and in the afternoon, the yard cleaned the hull with a high pressure. During the late afternoon and early evening the hull was degreased and a first coat of tar replacement was painted on the hull. Even when it was dark, she looked much better! I was curious to see her during the daytime. 10th June 2010 – In the morning I had to see the doctor. They had to remove rust circles from my eye. I stayed in bed all day in Bruges. A nice bed makes a lot of difference. But this also means no work on the Frantsis today, so, the planning to put her in the Water on Monday is at risk! 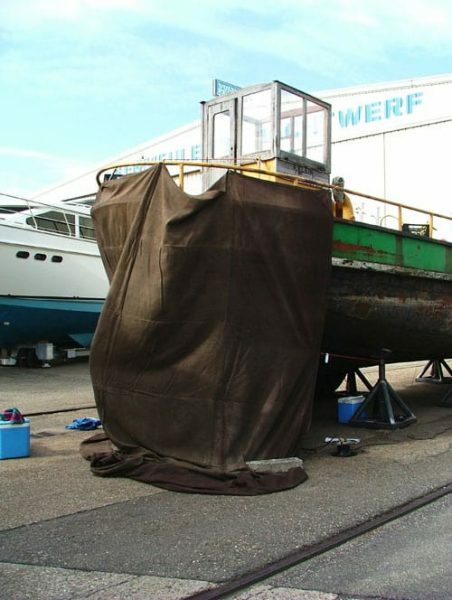 9th June 2010 – A nasty problem are the bilges of the boat. They are dry but there is a lot of old grease and rust. I cleaned the bilges today in the hold. In the afternoon and evening, some more plates were welded. Yesterday I must have gotten something in my eye, I didn’t sleep all night and I could barely see through my right eye. It became more and more of a problem, so they had to bring me to a hospital in Bruges. At the ER service, they removed a piece of tar or metal from my eye. 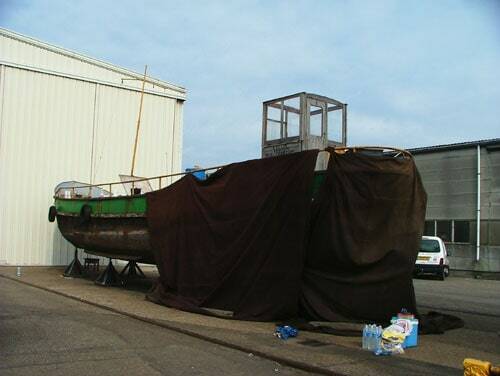 8th June 2010 – With the smell aboard of dried grease, welded metal and oil, It was hard to sleep aboard. We welded the whole day and by the end of the evening all plates were in position, a few of them already completely welded. Some more of the hull was cleaned as well. In the evening I setup a small tent to sleep in. It is colder on deck, but the air is much healthier!